Recorded 1981 at Vega Hall, Japan. The record that set the standard for fidelity. Often imitated, never surpassed. Now ready to set a new standard! Ready for new imitators. Produced in limited numbers and stamped for collection. Prepared to be amazed all over again! 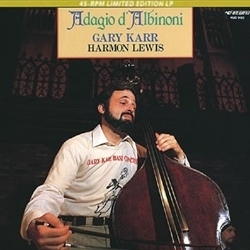 Since its introduction in 1982, Gary Karr's Adagio D'Albinoni has been a perennial favorite of audiophiles the world over. Rarely, if ever, has the deep, sonorous tone of the legendary Amati double bass been captured with such precision and verisimilitude. Stately and soulful, Gary Karr was a player of uncommon grace and this was the recording that set him in the pantheon of the greatest double bass artists. King Records engineering is incredibly nuanced, with complex harmonic blends created by the large recording hall mixing with you-are-there intimacy of close mic-ing the instruments. These are traits perfectly suited for higher speed playback full advantage. That amazing tone you've always loved is even richer, fuller and deeper. Harmon Lewis' organ is more detailed and the acoustics more realistic. Even if you own several copies of Adagio D'Albinoni, you'll want this one.